‘Aesthetics of Architecture’ (Scruton, 1979) is presented as an introduction to “the subject of aesthetics [for] those who have an interest in architecture”. It also advances a theory of aesthetics, where the designer’s stylistic choices are connected to individual flourishing; some stylistic choices, it is argued, will support such flourishing while others will hinder it. But the book is more than this. Like the contemporaneous ‘Morality and Architecture’ by David Watkin it is a defence of traditionalism in architecture, seeking to carve out a space for the practice of traditional design. Its illustrative photographs and drawings are mostly of pre-modern designs; its arguments take aim at modernists. Here is what is being missed, Scruton seems to say; you are not wrong to like it, and here also are reasons to resist the arguments of those who might try to reorient your taste. Since the book has the flavour of advocacy, the reader develops the sense that the arguments of prior philosophers included in the narrative are there not so much to inform as to be made use of: their talk of Hegel can be countered by our talk of Hegel, since he also said such and such. In this, ‘Aesthetics of Architecture’ differs (slightly) in its aim and in its tactics from Watkin’s ‘Morality and Architecture’, which simply finds objectionable a (supposed) Hegelian tradition in art history and does not attempt to recruit some other part of Hegel (or any part of any other philosopher). Here is an exegesis of Scruton’s aesthetic theory. We have a capacity to exercise certain judgements over a certain range of things that is universal: all reasoning persons may make such judgements; they are not a feature, say, of the psychological regularity of humans. An aesthetic judgement (giving the answer, say, to the question: ‘is this beautiful?’) is to be counted among these judgements. Are there (physical) objects we might make that are guaranteed to be judged as beautiful? No: every aesthetic experience is unique; we cannot say that everyone will feel or react in the same way to a certain experience, since that (exact) experience is not shared. In understanding aesthetic judgement, we would do better to turn our consideration away from experiences, and towards the critical faculties of those who undergo aesthetic experiences; are these individuals well equipped to make aesthetic judgements? Are they ‘cultivated’? Here, Scruton does not intend any kind of elitism; his view is that every person should be allowed to develop such faculties: “the kind of outlook … which would best reward aesthetic attention”. Indeed (argues Scruton) we have an obligation to support this development, since the exercise of a critical aesthetic faculty is essential to the self-realisation of every individual. Such a faculty comes about through engagement with a public world which “[bears] the marks of human action”, where such marks are not alien and unfamiliar, but consonant with prior aesthetic judgement. A critical aesthetic faculty is developed over time; through habit, through repetition in experience, through familiarity. There is therefore moral force to the call for the practice and maintenance of artistic tradition; only this will properly support the critical aesthetic faculty of individuals, and through it, human flourishing. Designers who have worked to develop qualities of figurative repetition and self-similarity in their output—things that might be called harmony—might see something in Scruton’s idea of a critical aesthetic faculty that comes alive through repetition in experience. In this creative mindset, what presents itself as beautiful can be analysed as containing the same thing repeatedly; a proportion here is repeated in a proportion there, but transcending monotony through scaling, or material or colour change, or some other transformation. The embrace of consonance can be extended to context: the designer also reflects the proportions of neighbouring objects (i.e. buildings) in their own contribution, aiming at a greater whole, assembled collaboratively, and over time. This attitude is naturally friendly to artistic tradition; the greater whole is a long term, possibly generation-spanning project; as such it requires tradition. But which tradition? Scruton—in the text at least—conscientiously leaves this question open, as if to say only that at least some tradition in architecture is to be followed. However, he does tentatively advance as essential two features found in classical architecture; mouldings (i.e. smooth unrelieved surfaces should be avoided) and facades (a building should have an obvious public face demarcating the boundary between the exterior and the interior). And the book itself, as noted above, favours pre-modern illustrative examples; of these, classical and baroque buildings are the majority. This seems hopeful, as if we are to be suggested to a correct conclusion through visual immersion. The reader can easily imagine a broader editorial selection, where Corbusian villas sit comfortably alongside Palladian villas (as in Colin Rowe’s well known analysis of proportional similarity in the work of these two architects), and with the modern examples giving visual support to Scruton’s argument just as effectively as the classical examples. Or perhaps, if mouldings are essential as Scruton says, we would be pleased to see examples from an alternative modern tradition that features mouldings; one of Frank Lloyd Wright’s textile houses, for instance. And is a person’s critical aesthetic faculty really so fragile as Scruton seems to say? We can agree that experience is necessary to the development of a mental faculty; why wouldn’t we believe that a given mental faculty is as well—or perhaps better—developed when that experience is heterogenous? Analogously, music is often taught as a progression through a canon; hence a developing piano player starts with Bach, Clementi, Mozart, early Beethoven; only later exploring, say, Villa-Lobos. The aim is security in a skill that takes time to acquire. Yet some modern composers have deliberately intervened in this process: Bartok’s ‘Mikrokosmos’ is a large collection of piano pieces for players of all skill levels, and features alternative tonalities, scales and rhythms throughout. Nobody thinks Bartok subverts musical education in this way, or that players raised (partly raised, in all likelihood) on ‘Mikrokosmos’ will be deficient in skill or sensitivity. Similarly, we can question Scruton’s call for stylistic adherence; the repetition of the familiar. Will we fail to develop as individuals if we sometimes experience the unfamiliar? It looks doubtful. Is there a way forward for Scruton? Yes, I think so, although it doesn’t necessarily lead to an outcome he’d like. By making community—one where both designers and users of buildings operate within a tradition—of central importance, Scruton makes an argument that looks somewhat Hegelian, and indeed Scruton acknowledges this connection in his text. For Hegel, the self can realise itself only within a community (and I take the term ‘community’ to stand adequately for ‘spirit’, or ‘geist’). However, Hegel also claims that for this realisation of self to properly succeed, the community of which the self is a member must also undergo a process of self-realisation, through critical self-examination. The community progresses and eventually arrives at a well-founded—and inevitable, so long as progression occurs—modernity. So Scruton might propose that the traditional architecture which he favours simply is modern. It just is the outcome of the critical self-examination undergone by our community. After all, it worked for Hegel. If Hegel can confidently use the term modernity, as he did, in the context of the architectural designs of his classicist contemporaries such as, say, Schinkel, why cannot Scruton hold that the description ‘modern’ still applies to classical architecture today? (A perspective of Schinkel’s design for a palace on the Crimea is shown above.) Beyond simple distaste for the second part of Hegel’s scheme as I’ve sketched it above, I suspect Scruton’s reluctance to do just this stems from it not passing a laugh test. Far too much has to be discounted or ignored; the evidence has piled up on the wrong side and in alarming quantities. And it opens a door that Scruton wants to hold shut. 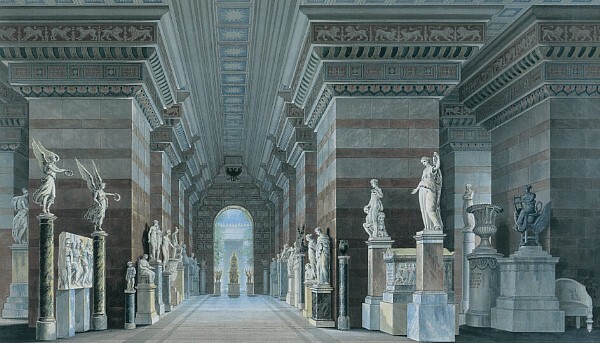 A modernist—as conventionally understood—can point to the very extensive architectural design work and literature post-Hegel, and, more importantly, post-Schinkel. Look at all this re-evaluation, the modernist can say. Look at the nineteenth century ‘battle of the styles’. Look at the continued attempts in the twentieth century to find a resolution. Look at what’s happening now. Look at the possibilities. There’s your geist in action. This well-rehearsed rhetorical line of modernists of the Pevsner era is surely just what Scruton wants to steer the discussion away from. Uncharitably, we can say that he takes the part of Hegel that he finds useful, and discards the part that will probably only help his opponents. More charitably, we can say that he seeks to highlight a part of Hegel that modernists might overlook; the implication in Hegel that designers should consider the ways in which the built environment might affect the self-realisation and development of individuals. This entry was posted in Traditionalism on August 16, 2018 by charlespwhitaker.